5 March 2010 update: Holbrooke says sorry. Indian officials have described as “absolutely incorrect” the statement by Washington’s AfPak envoy, Richard Holbrooke, that India was not the target of last week’s terrorist attack in Kabul. The officials expressed surprise and even consternation at this assertion, which, they said, ignored the fact that the terrorists’ primary target was a building used by the Indian medical mission. The U.S. assessment, they said, also ran counter to what Afghanistan’s intelligence agency, the National Directorate of Security, has established so far. On Tuesday, NSD spokesman Saeed Ansari told AP in Kabul that there was evidence Urdu-speaking Pakistanis from the Lashkar-e-Taiba had been involved in the attack and not the Afghan Taliban. According to Indian officials, the NSD has established that the terrorists were indeed looking for Indians and had specific information about who was present, including NGO women from SEWA and a senior diplomat on secondment to the Afghan Interior Ministry. New Delhi, however, believes there is no room for doubt. “A huge bomb is detonated just outside the Indian medical mission. A terrorist walks in lobbying grenades and firing from room to room. He had prior knowledge about the occupants… If this is not an attack targeted on Indians, what can it be?” said a senior official. Afghan investigators have noted that last week’s terrorist attack was very different from the January 18 Taliban strike at the Faroshga mall in central Kabul. 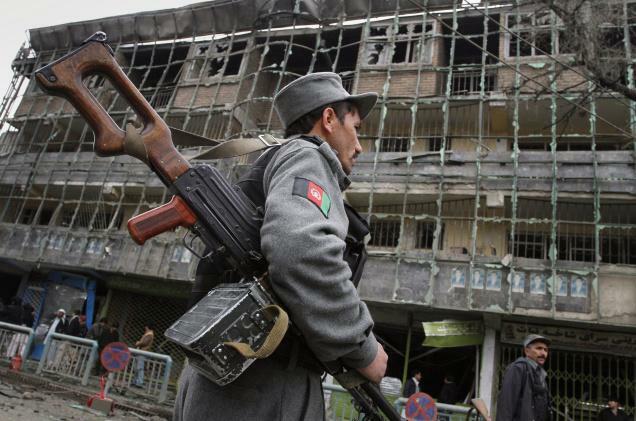 The gunmen had allowed Afghan shoppers to leave before training their fire on the security forces and destroying the building. In contrast, the Afghans guarding the Indian medical mission were the first to be shot dead by the terrorist who entered the compound following the huge explosion triggered outside. “The guards shouted ‘Don’t kill us, we’re Afghans’ but they were shot all the same,” an Indian official said. With Major Ritesh Roy of the Army Education Corps succumbing on Wednesday to injuries sustained during the February 26 attack, the total number of Indian fatalities has risen to 7. This entry was posted on March 4, 2010 by Siddharth Varadarajan in Afghanistan, Indian Foreign Policy, U.S. Policy in South Asia.